Editor’s note: This analysis article is not edited and the authors are solely responsible for the content. The views and opinions expressed in this article are those of the authors and do not necessarily reflect the official policy or position of Integrative Practitioner. The message from Google shared outcomes of the science-backed and volunteer-intensive effort to move acupuncture into the nation’s chronic pain treatment. The pattern of acupuncture uptake amidst the opioids debate has slowly constellated over recent months – a veterans’ program here, a community health center there. In truth, one Associated Press account of use in the military and among veterans stimulated the flurry of publications. Yet the article nods to states where lawmakers have opened Medicaid to acupuncture, and to military installations across the country in which a reported 66% offer acupuncture. That these media are choosing to re-publish this story among the scores that pass their editors’ eyes each day speaks to how brightly the acupuncture option is now glowing. 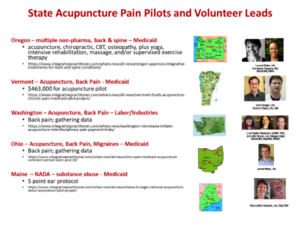 Integrative Practitioner has highlighted the initiatives of state legislators with backing from volunteer state acupuncture leaders who come in with the evidence. Such initiatives have been reported here for Oregon, here for Washington, here for Ohio, here and here for Vermont, and here for Maine. Another sort of volunteerism has undergirded these efforts. The Acupuncture Now Foundation and the American Society of Acupuncturists and their allies have steadily developed scientific resources to arm advocates with the data and studies that in turn power up the presentations of their legislative champions to help corral the naysayers and elicit yes votes from those on the fence. Remarkably, the force pushing decision-makers off the fence – while backed by science – has a more human face. For a second time in the recent history of mainstream medicine’s uptake of alternative medicine, a collective chorus of human beings known variously as citizens, consumers, voters, or patients is the difference-maker in policy decisions. The first was the evidence of consumer use in the January 28, 1993 study from Harvard’s David Eisenberg that shook major politicians, media and leaders of the dominant school of medicine. A third of the sky was filled with users of unconventional methods. Something big was happening that wasn’t exactly clear. When this high usage opened the eyes of politicians, media, insurers, employers, hospitals and others, engagement by these stakeholders was both responsive and frank opportunism. They wanted to appeal attract the patients and $13.7-billion dollars Eisenberg’s group found. Now the crisis in chronic pain management – a.k.a. the opioid crisis -- is the opportunity that has not just knocked for acupuncture. It is ram-rodding down doors. The Associated Press cites anti-CAM careerist Steven Novella accusing acupuncturists and their proponents of "exploiting the opioid crisis to try to promote acupuncture as an alternative treatment." Much to Novella’s chagrin, the sentence would more appropriately have read “to successfully promote” the science and practices they represent. Notably, the success story in the Associated Press article of a patient who used acupuncture was one “Marine Veteran Jeff Harris.” It is his story and those like Harris’ that are shifting the “trying” of the last 30 years to the success today. 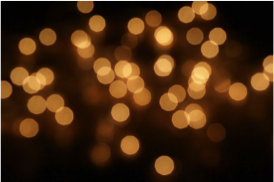 These individual tales are the points of light. They are finally training the eyes of policy makers on the mounting evidence of value. One suspects that the contraposing of the image of the no nonsense, hard-headed Marine with the subtle energy of acupuncture is part of acupuncture’s appeal to media and politicians alike. Many associated with other energy-related biofield practice – from therapeutic touch to homeopathy -- have wondered why their fields, despite their own bodies of research, have not seen as much attention. That is a complex subject for another day. What is clear now is that, for acupuncture and acupuncturists, the opioid crisis has been a turning point for acupuncture in US medicine. John Weeks is a writer, speaker, chronicler and organizer with 32 years of experience in the movement for integrative health and medicine. the long-time founder/editor of The Integrator Blog News & Reports, a primary connective terrain for the diverse stakeholders and professions in the field and was invited in May 2016 to serve as editor-in-chief of the Journal of Alternative and Complementary Medicine. Besides his Integrative Practitioner column, he presently writes for Integrative Medicine: A Clinician’s Journal, the Huffington Post and elsewhere. He increasingly enjoys teaching and mentoring. He has keynoted, led plenary sessions, breakouts, and offered guest lectures for dozens of organizations ranging from the Bastyr University to the Association of American Medical Colleges, the UCLA School of Medicine to the Institute for Health and Productivity Management, the AANP and AIHM to the American Hospital Association. He has consulted with insurers, employers, professional organizations, universities and government agencies at all levels. As an organizer, Weeks convened the Integrative Medicine Industry Leadership Summits (2000-2002), directed the National Education Dialogue to Advance Integrated Care (2004-2006), fund-raised the start-up of the Integrated Healthcare Policy Consortium (2002), and co-founded the Academic Collaborative for Integrative Health, which he directed 2007-2015. In 2014, three consortia and others combined to grant him a Lifetime Achievement Living Tribute Award. Four academic institutions have granted Weeks honorary doctorates for his work. Seattle-based, he considers himself a particularly lucky soul to have worked remotely while living with his spouse Jeana Kimball, ND, MPH, and their children in Costa Rica, Nicaragua and Puerto Rico for 6 of the last 15 years.